If you are a critter person, like me, you can really start to feel down in the dumps this time of year. There are no frogs to enjoy on the pond edge, no turtles to watch meandering along through the grass, and butterflies seem like a distant memory. But I have learned to look closer to see things going on right in front of me. This past weekend, I enjoyed the spring-like weather by walking around the timber. With a specific purpose in mind, I headed towards some of the cedar trees down the lane. These prickly trees are not something I would usually look in, but I was in search of an odd item that you may have seen before. In fact, the first time I saw one was in early December, several years ago, when we were cutting down our Christmas tree at Rawlings Tree Farm near Beardstown. I tend to look closely at nature, seeing details many miss. And on this day, my curiosity served me well. As we were loading our tree in the truck, I noticed a brownish, foam-like ball attached to one of the tree’s lower branches. When we went to pay for our tree, I asked the owner if she knew what it was. She waved for me to come in the garage and pointed to a 5-gallon bucket filled with these oddities. She explained that what I had found was an egg case of a praying mantis. 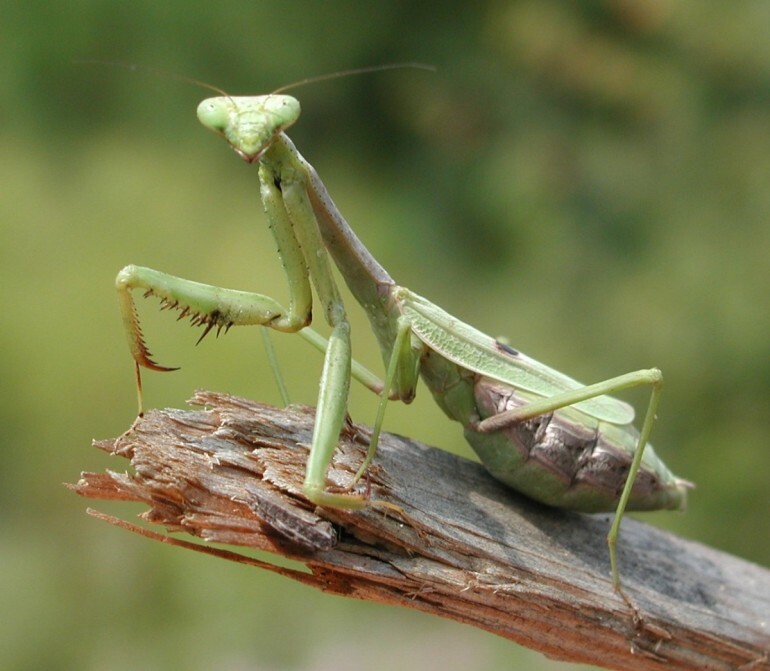 The praying mantis is an insect with a voracious appetite, and is an excellent insect to have in your gardens. Being completely carnivorous, they will eat any insect they can by waiting in quiet ambush, often for hours at a time. Aphids, tiny destructive insects, are always on the menu. This is good news to the flower or vegetable gardener. 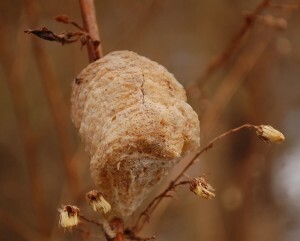 One egg case can hatch several hundred tiny mantises. Several weeks of warm weather is needed for them to hatch. Once they sense that summer is in full swing, they will all hatch at the same time. When hatching, the mantis’ young crawl between the tiny flaps in the egg case and then hang from silk threads until they have dried out. This entire process happens in less than 2 hours, and because the egg case doesn’t change in any way, it can be very hard to know when the hatching has occurred. Egg cases can be hatched in a paper bag by folding the top and sealing it with a clothes pin. Put the bag in a window with direct sunlight. Check the sack periodically, releasing the hatchlings outside as soon as possible. Praying mantis’ egg cases can be purchased online and through some garden catalogs, but I prefer to find them the old fashioned way. While the female will lay her many cases on any branch, they prefer evergreens. Carefully remove the case, along with part of the branch it was laid on. If you find an egg case, please post a picture to our Facebook page.